Ever wondered how to make candles? 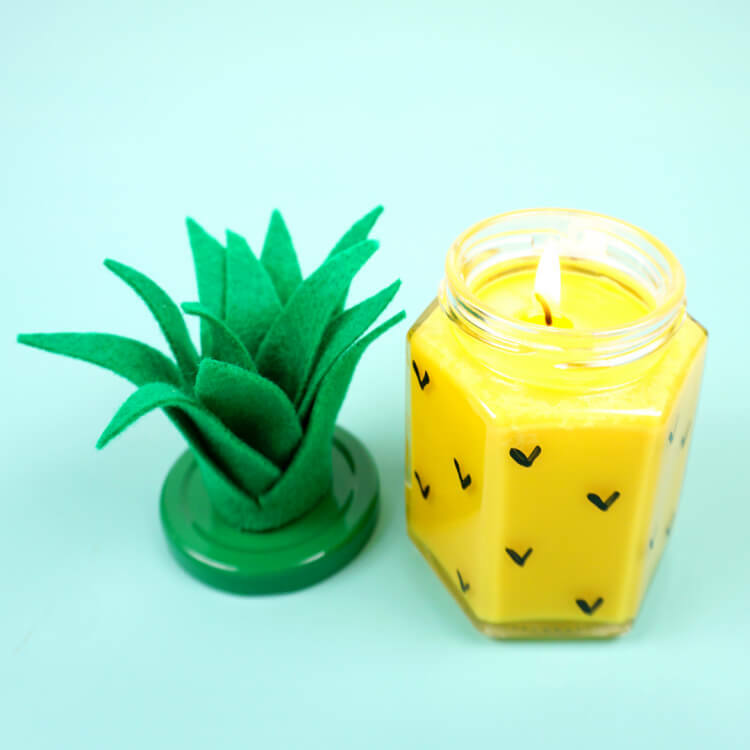 These Easy DIY Pineapple Candles are SO simple to make, and they smell amazing! Makes a great DIY gift idea for friends, family, teachers, neighbors, and more! 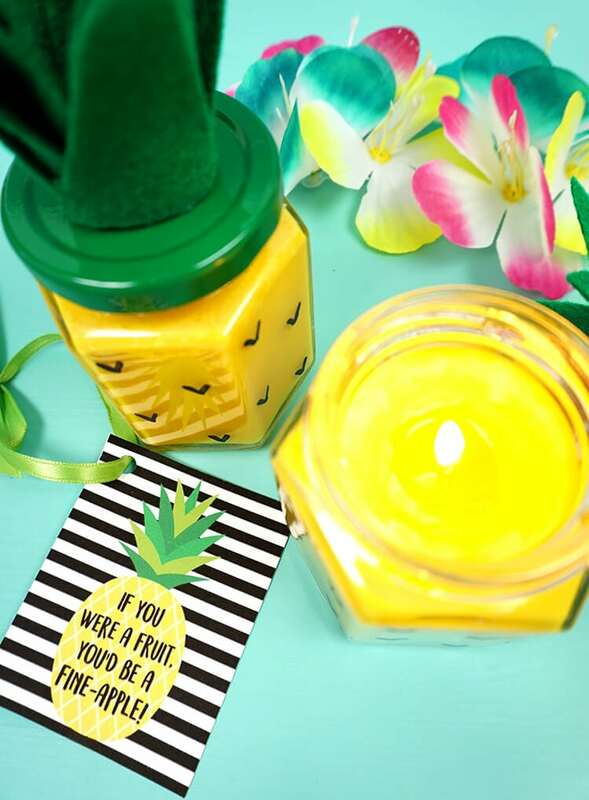 Pineapple is one of my favorite fragrances – it’s so fresh and summery! 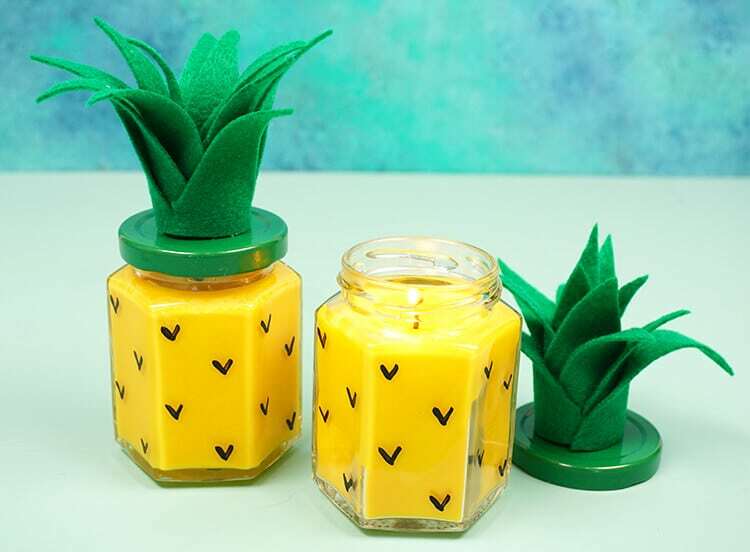 I’ve already made pineapple soaps and pineapple sugar scrub, so it was only natural that my next pineapple fragrance endeavor would be pineapple candles. 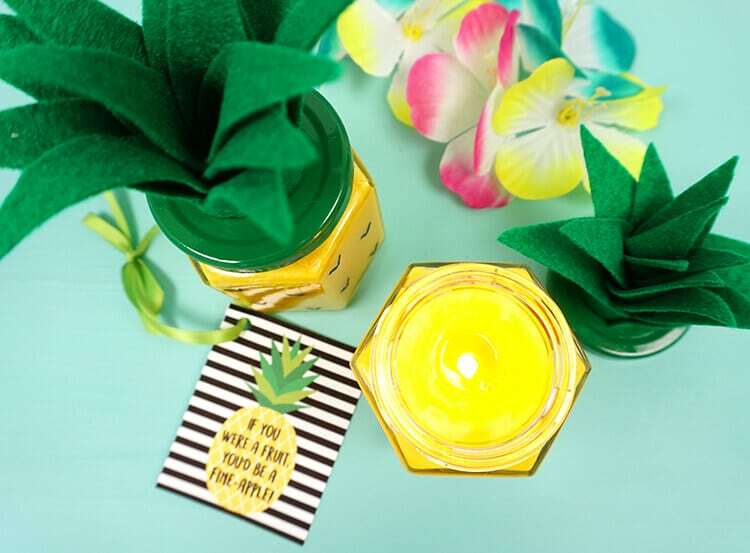 Homemade candles are quickly becoming a favorite craft of mine – they’re SO quick and easy to make, and there are a ton of creative ways that you can decorate and finish them! 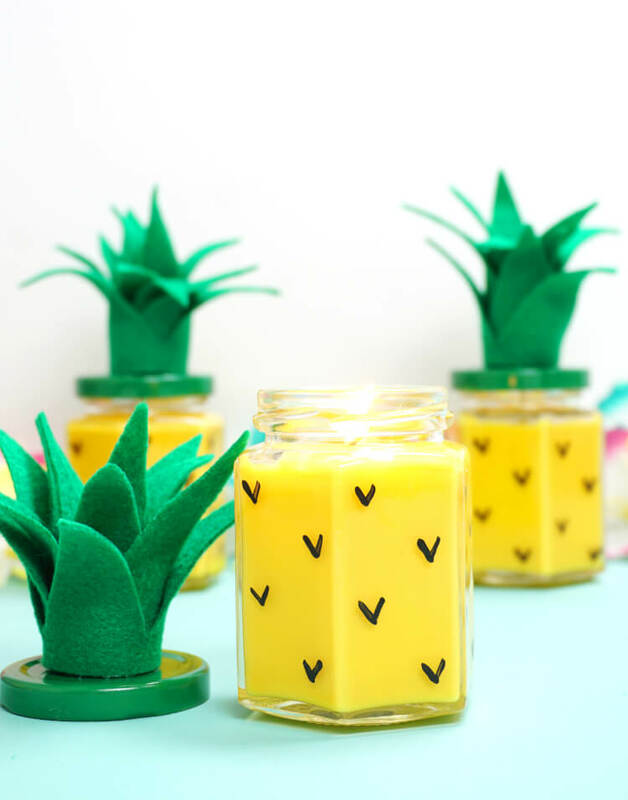 These easy DIY pineapple candles are super cute, and they’re a cinch to make! 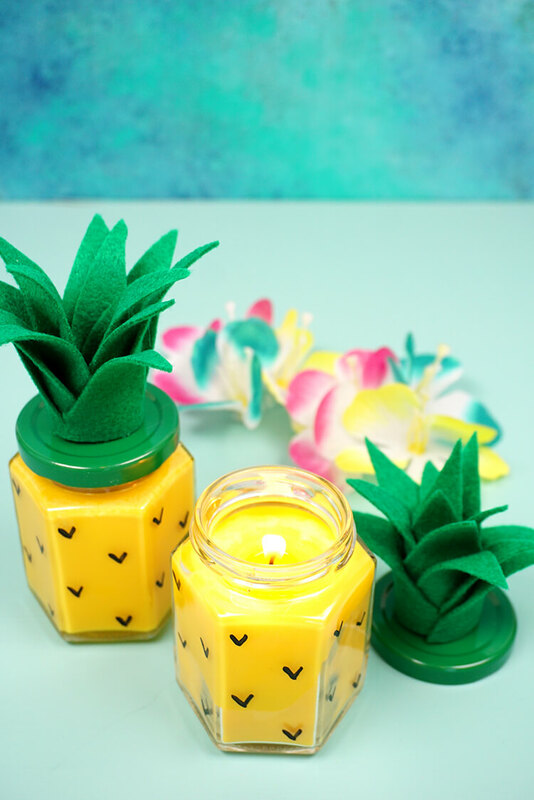 Oh, and my friends made some seriously awesome pineapple projects, too, to kick off Pineapple Week at The Weathered Fox, so make sure you scroll all the way to the bottom of this post to check them all out! Note: quantities listed will yield three six-ounce jar candles. Use a drop of hot glue to attach the candle wicks to the center of the bottom of the glass jars. In the candle pitcher, over low-medium heat, melt four cups of soy wax flakes, stirring frequently. 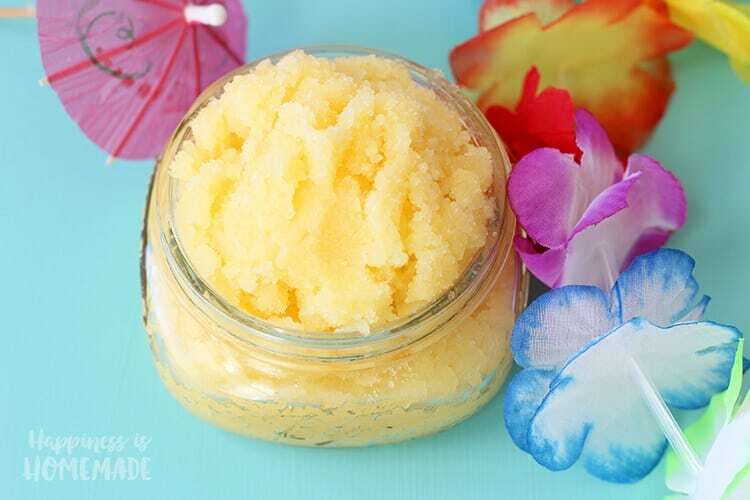 Add 3 blocks of yellow wax colorant along with 20-30 drops of pineapple fragrance oil. Mix well. Carefully pour the hot wax into the candle jars. Allow the candles jars to sit undisturbed until completely cool. While the candles are cooling, paint the lids of the jars green. Cut and assemble felt tops as shown in the video above. Use the hot glue gun to attach the felt toppers to the jar caps. Easy peasy! These were super quick and easy to make, and they’re totally adorable! We are definitely making more of these for our homemade holiday gifts this year! 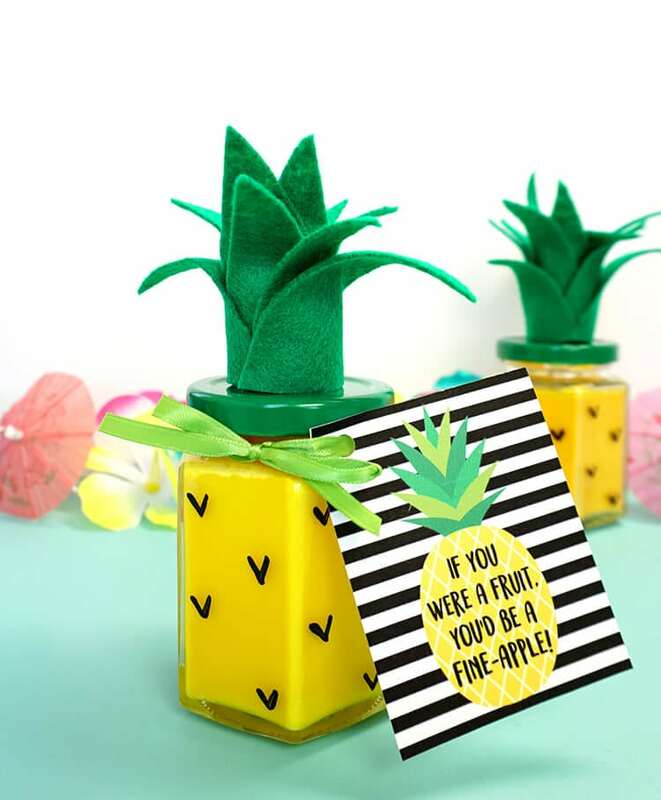 I recently shared these fun pineapple printable gift tags, and they’re perfect to pair along with your homemade gift (there’s also a non-text version if you want to write your own message!)! Such a cute and easy DIY gift idea! I can think of lots of people on my gift list that would love these! 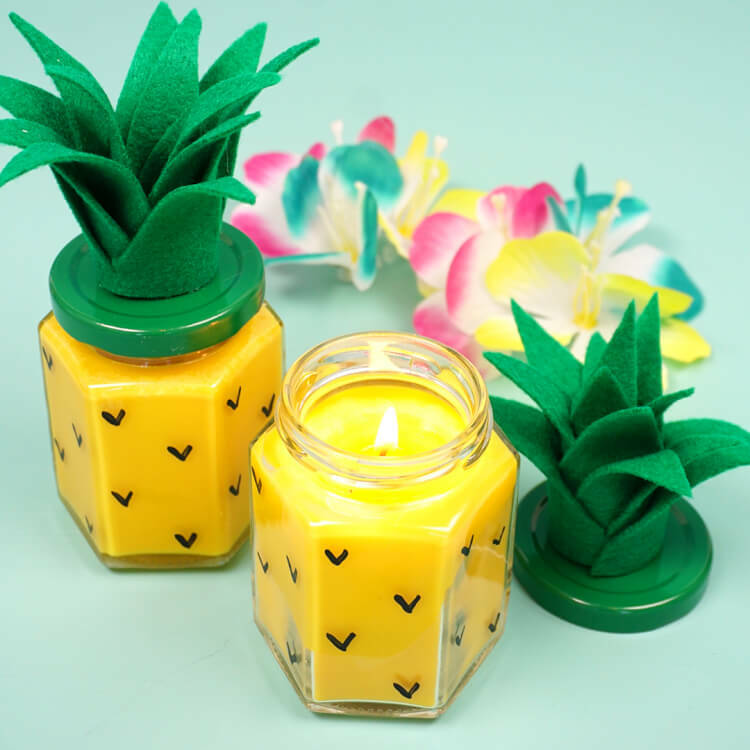 If you love these pineapple candles, you may also like our DIY Pineapple Soaps and Piña Colada Sugar Scrub, too! 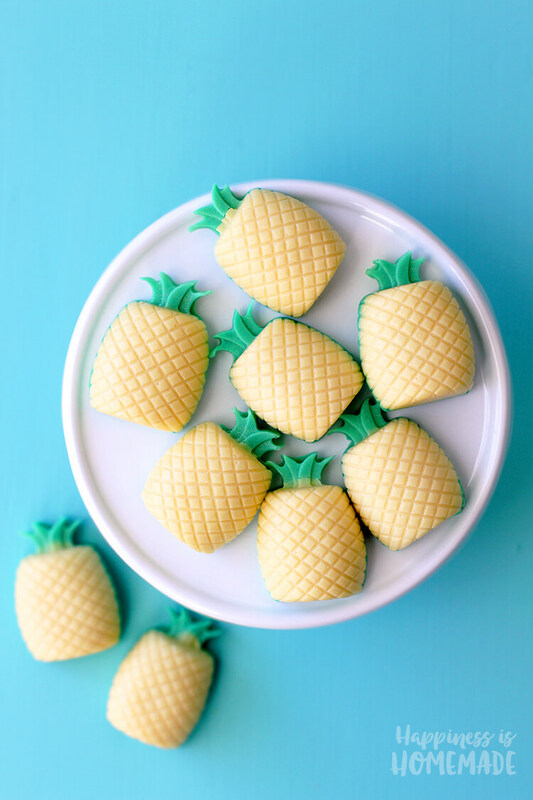 If you love pineapple, you totally need to check out these awesome crafts and recipes from a few of my friends! 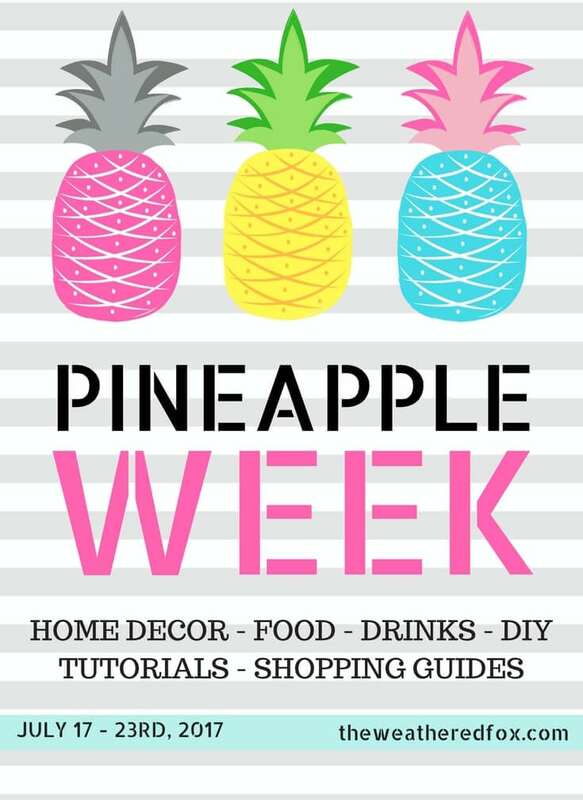 Be sure to stop by The Weathered Fox for all sorts of pineapple goodness – new crafts, tutorials, recipes, printables and more every day this week! 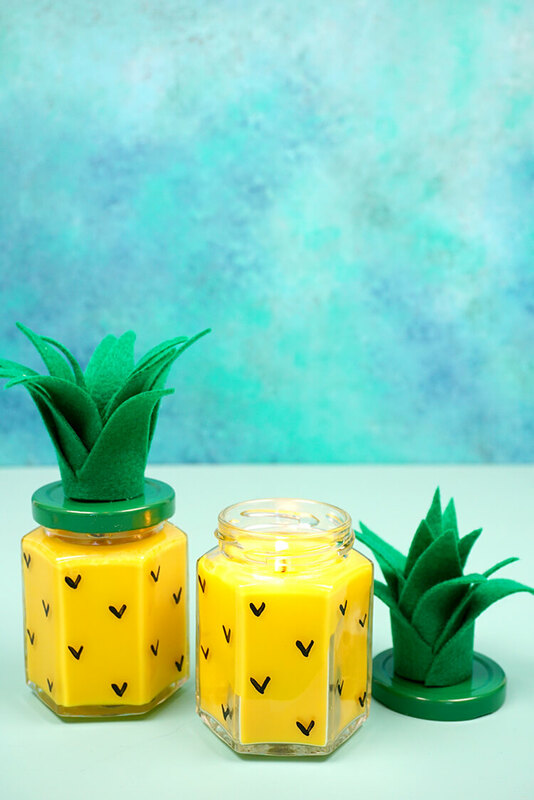 If you like these pineapple candles, don’t forget to pin ’em! 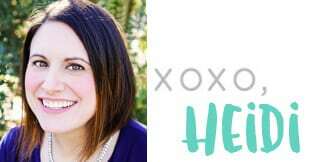 Heidi! These candles turned out fantastic! 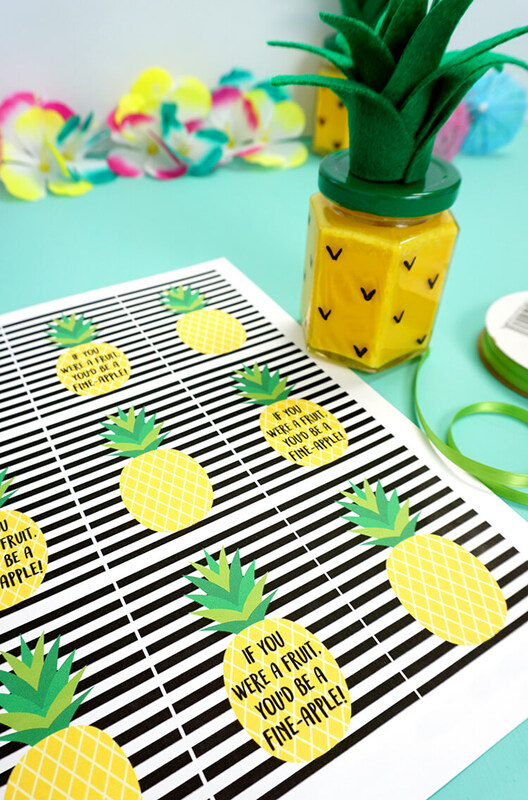 I love that you paired them with the cute little pineapple printables too! I’ll definitely be sharing those this week! Thanks so much for joining the hop! these are totally cute! Pinned! These are SO cute! 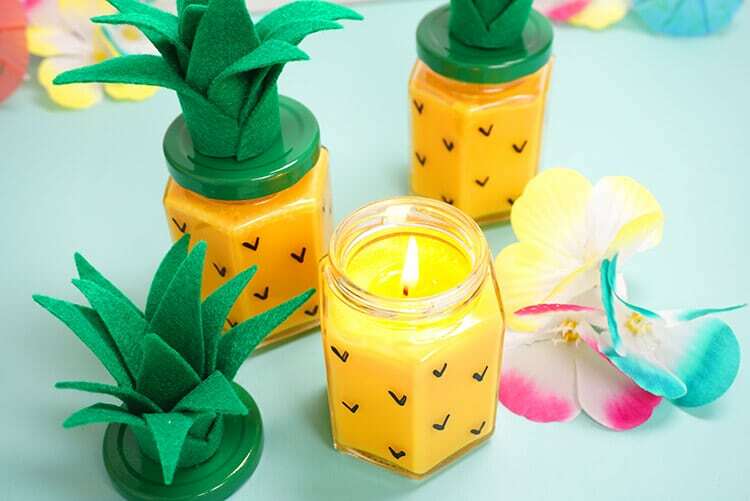 I love the smell of pineapples and I know a pineapple candle would totally boost my mood and make my house smell amazing. I can’t wait to try this! I love this! It is adorable and such a great idea! Just as a heads up, when I try to share this on FB, it gives me a 404 error. Thanks for the heads up, Kristin! I’ll check into that! I love a pineapple craft and this is a fun one that will make a great gift. Thanks for the inspiration. SUCH a cute craft. Love the video too! Wow candles look yummy 🙂 jus kidding. Good way to enhance the candle. Did you add any flavor for the fragrance? Could you use yellow beeswax instead? I can’t wait to make these, they are adorable!